The number of digital lines varies from device to device. The following figure shows signal connections for three typical DIO applications. The figure shows PO <0..3> configured for digital input and PO <4..7> configured for digital output. Digital input applications include receiving TTL signals and sensing external device states such as the state of a switch. 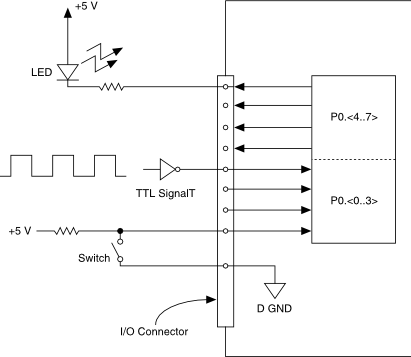 Digital output applications include sending TTL signals and driving external devices such as the LED shown in the figure.